Which of these will come true, and which will sink to the bottom of the Narrow Sea? The Game of Thrones season seven premiere is imminent, yet still very little is known about what might happen. Daenerys is going to Westeros, sure, but what's she going to do there? Jon Snow is King in the North now, but what does that even mean? Is Nymeria the direwolf alive? Is Cersei about to get her comeuppance? These questions will remain unanswered for as long as David Benioff and D.B. Weiss feel like leaving them unanswered, but in the meantime, there are plenty of spoilers out there if you know where to look. Read on for a roundup of everything that paparazzi photos, call sheets, and Instagram snaps imply might happen this year, but only while remembering that Kit Harington claims they intentionally film fake scenes to throw the internet off real plot lines. This post contains possible, unconfirmed spoilers and rumors for Game of Thrones season seven. 1. Jon Snow and Daenerys will finally meet. This is a widely held theory, but a costume designer appeared to confirm the news in a recent interview with a quote about Jon's outfits. "There are times when we removed [his cape] because we wanted him to be more vulnerable," Michele Clapton told The Telegraph. "Especially I think, when he saw Dany, and he went to see her for the first time in her chamber." There are also paparazzi photos that the show Kit Harington and Emilia Clarke filming scenes together, though it's possible those are some of the "fake" scenes Kit mentioned on Jimmy Kimmel Live. 2. Gendry is coming back. This is also a popular theory, and like the Jon/Daenerys rumor, it's backed up by photos — actor Joe Dempsie was seen around Belfast, one of the show's filming locations, last year. He also walked the carpet at the season seven premiere. 3. Nymeria is coming back. Before they made their account private, the company that provides the wolves used for the show Instagrammed a photo of a wolf that looks like Arya's beloved direwolf, last seen in season one. Actress Maisie Williams was also seen in Canada where the wolf scenes are shot, leading to speculation that Arya and Nymeria will have a tearful reunion. 4. Arya will make it back to Winterfell. This one has to do with the catspaw dagger Maisie wore during a cover shoot with Entertainment Weekly. That weapon belongs to Petyr Baelish, who was last seen at Winterfell. If Arya has it now, does that mean she took it from him at Winterfell? Or did they meet somewhere else? Either way, Littlefinger should watch his back. 5. Ser Jorah will make it to Dragonstone, greyscale cure in hand. Last season, Daenerys left Ser Jorah in Essos to find a cure for his newly acquired greyscale, but paparazzi photos show Iain Glen filming scenes with Kit Harington and Peter Dinklage, in a location that appears to be serving as Dragonstone. 6. Viserion will become a zombie dragon. This one is truly out there, and originated in a since-deleted Reddit post claiming to have spoilers for the new season. According to this rumor, the White Walkers kill Daenerys's dragon, then resurrect him so that he becomes an undead ice dragon. Great, yes, make it happen. 7. Daenerys burns someone alive. A grainy video shot during filming shows an actor yelling, "Khaleesi! What kind of witchcraft is this?" as a fireball explodes. Is this the doing of her dragons? Is she going — ahem — mad? Or is every single person on this crew messing with you? 8. The Iron Bank is coming to collect. Mark Gatiss, who plays Tycho Nestoris, saidback in the spring that he'd filmed new episodes of the show, though he didn't say where he'd be in Westeros or which characters would interact with Tycho. Hope Cersei found some gold under Casterly Rock! 9. You'll see Casterly Rock. Eagle-eyed viewers think you can see Casterly Rock in the background of a shot featuring Grey Worm in one of the new trailers, and fan site Watchers on the Wall believes one of the new castle filming locations will serve as the Lannister stronghold. 10. Bran is going to the Wall. This makes sense, because Bran's business Beyond the Wall did not go so well. In promo photos of the premiere episode released by HBO, Bran's traveling companion Meera Reed can be seen standing near the tunnel in the Wall, so it's probably safe to assume that Bran is with her. 11. Jim Broadbent is playing Marwyn the Mage. Like Ian McShane before him, Jim Broadbent cares little for your pedestrian concerns about spoilers. "I’m a maester, an archmaester," he told Screencrush. "I’m an old professor character." Book readers will remember Marwyn as one of the people at the Citadel in Oldtown, where Samwell Tarly headed last season. 12. The Lannisters will sack Highgarden. Last fall, Watchers on the Wall reported that a new location would act as the Tyrell stronghold of Highgarden, and paparazzi photos showed extras dressed in Lannister colors filming battle scenes. Cersei, you'll recall, killed Margaery and Loras Tyrell in her big wildfire explosion, but she'll need to make another move to really cement the house's destruction. 13. There will be a huge battle between Lannister and Targaryen forces. Footage screened at a Spanish HBO exhibit showed Daenerys's Unsullied attacking what looked like Casterly Rock. 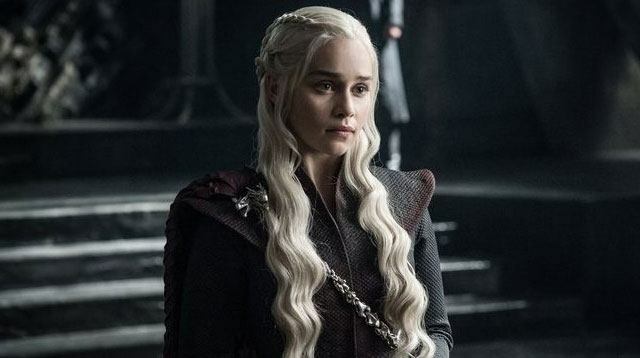 Fans have speculated that Daenerys will accomplish this attack with help from Tyrion, who knows his way around the sewers at his ancestral home. 14. Walder Frey is coming back. Arya killed Walder Frey in last year's season finale, but actor David Bradley's resume says that he'll be returning for season seven. It's possible he's just coming back to play Walder's dead body, but you never know! Maybe the Walkers are looking to add a lecherous old patriarch to their ranks. 15. Alys Karstark will be introduced. In A Dance With Dragons, Melisandre has a vision of a young woman riding toward the Wall; this woman is Alys Karstark, and when she arrives, Jon Snow plans to wed her to a Thenn for diplomatic alliance purposes. The character hasn't appeared on the show yet, but last year, reports surfaced that an actress named Megan Parker had gotten the role. 16. Yara Greyjoy will be dragged through the streets with Ellaria Sand after losing a battle to Euron. Paparazzi photos showed actress Gemma Whelan tied to Euron's horse during filming in Spain; Indira Varma, who plays Ellaria Sand, was also on set for these scenes. 17. There's going to be a huge meeting in the dragonpit with most of the main characters. Leaked concept art showed several characters meeting in area that appears to the dragonpit from the books, an area in King's Landing where the Targaryens used to keep their dragons. The actors who play Jon Snow, Cersei, Daenerys, Tyrion, Bronn, Lord Varys, Ser Jorah, the Mountain, and Missandei were all spotted filming at the location that's being used as the alleged dragonpit, and fans speculate that whatever happens at this big summit will happen in the season finale.